I've said it before and I'll say it again - if you are ever in the City of London, do take a stroll through Leadenhall Market and pop into Amathus Drinks. Often, there is some new spirit, wine or liqueur to sample and I guarantee you'll leave with a lighter wallet, but with a spring in your step. Even if there is nothing new to try that day, Diosa and Tom who (wo)man the store are friendly, well informed and always happy to talk you through the mind boggling array of booze that towers overhead in the little shop. My latest visit unearthed this treasure and it was love at first sip. 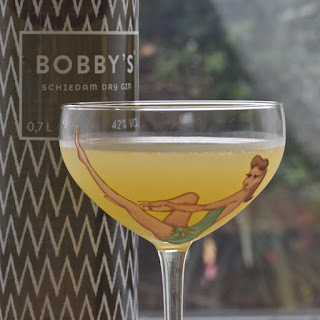 Bobby's Scheidam Dry Gin is bursting with the exotic flavours of lemongrass and cubeb peppers (which have an almost piney undertone), as well as juniper, rose hip and clove. 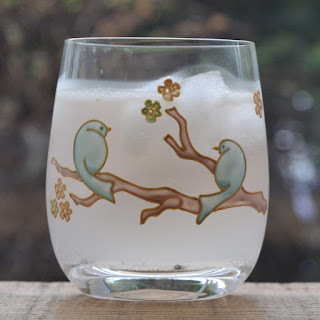 This week, I wanted to bring in the flavours of Southeast Asia and Morocco to really enhance that lemongrass/cubeb pepper taste and create cocktails that I could sip in the garden while we enjoy some unexpected and practically tropical weather. This first cocktail (see above) is a fresh, fruity drink that isn't overly sweet. The addition of the freshly squeezed orange juice and triple sec could be a little sweet, but the lime juice adds a zing that combines with the fresh thai basil and the lemongrass of the gin, to create a taste that evokes the fresh flavours of Thailand. Muddle (gently squish) the basil leaves in the bottom of a shaker with the gin and triple sec. Add a handful of ice and both the lime and the orange juices. With the lid firmly closed, shake the cocktail until the outside of the shaker becomes frosted over. Remove the lid and strain into chilled cocktail glass. Muddle (gently squish) the mint leaves in the bottom of a shaker with the gin. Add a handful of ice and both the lime juice and passion fruit syrup. Remove the lid and strain into chilled cocktail tumbler, with a couple of large ice cubes. Top up the drink with a little sparkling water, but don't overdo it - add a little, stir with a swizzle and test. You can always add more, but you can't take it away! 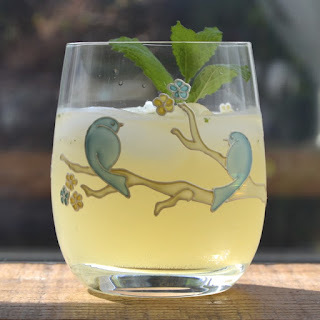 Garnish the drink with mint, gently slapping it between your palms to release the minty aroma. 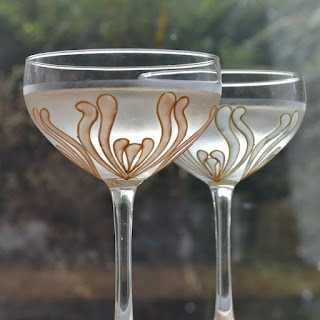 This gin makes a mean martini - it's so distinctive in flavour that it doesn't need a lot of dressing up (although dressing up is fun), but I have added a little ginger liqueur for a touch of heat and to give a little twist to a classic cocktail. Add all of the ingredients to a shaker with a handful of ice. Cardamom and rose are beautifully suited to one another and this is a cocktail that will work with many different types of gin. However, once again, the fragrant lemongrass just adds another dimension that will arouse your sense of smell as well as taste. The gorgeous Van Wees Rose Without Thorns (also from Amathus Drinks) is distilled from a selection of different roses, selected for their exceptional fragrance and the result is heady to say the least. Gently muddle (squish) the cardamom pods with the gin and rose liqueur. Add the lemon juice and a handful of ice. Top up the drink with a little elderflower tonic - remember, easy does it - stir and serve. I hope the sun is shining where you are too. Have a fabulous weekend!